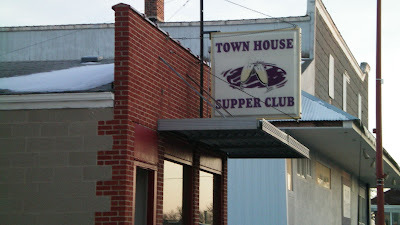 The area between Iowa Falls and Waterloo is home to the Townhouse Supper Club in Wellsburg. 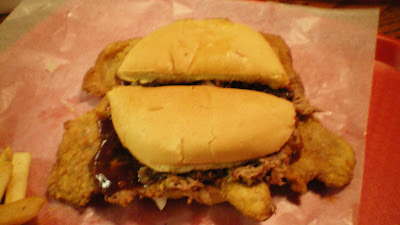 The winner of the 2006 IPPA Pork Tenderloin Sandwich Competition is found here. Since Highway 20 was rerouted a few years back, this place is now closer to the state highway. This is a town you won't want to drive past. Location: 520 North Adams St. in Wellsburg (population 716 in 2000 Census), on the edge of Grundy County a couple hours drive north and east of Des Moines. Directions: Take Highway 20 between Iowa Falls and Waterloo, go south at Wellsburg exit, look for tenderloin sign in picture. Price: $7.25 for dinner with side, $4.80 a la carte during lunch. 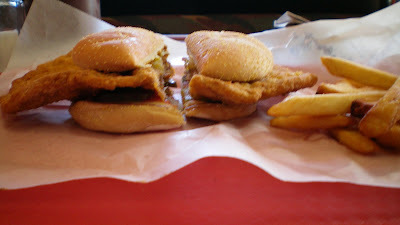 Also on the menu: Regular diner fare, including burgers, steaks, fish, chicken, and onion rings. Service: Seat yourself with waitresses always closeby. Ambiance: There is pride in the tenderloin, evidenced by the clearly displayed newspaper clipping of the IPPA award. 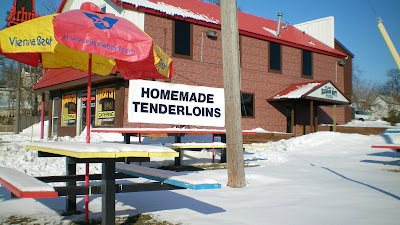 Tank tops and shirts pronouncing the best tenderloin award are everywhere. The wood-paneled walls are covered in pictures of race cars. Speed Network is playing on the TV in front. Many patrons were making orders for takeaway. 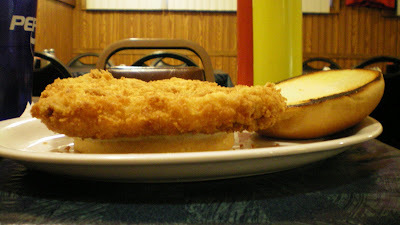 This Eastside restaurant has recently added the Breaded Pork Tenderloin Sandwich to their menu. As you can see by the pictures, they promoted its homemade status. 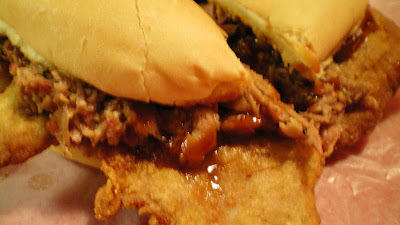 They take their barbecue seriously, and already had one pork sandwich on their menu the last time I visited. 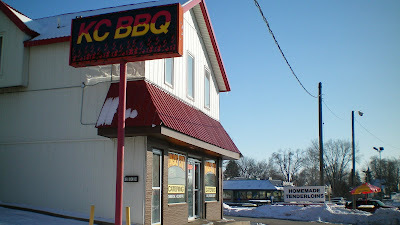 KC BBQ has persevered while other small-time barbecue restaurants have had to cut back to catering exclusively. Location: 205 E. 14th St. Wedged between Arby's and Burger King, east of State of Iowa office buildings and south of Mexican business main street on Grand Ave. This building once contained a Maid-Rite. Price: $4.75 with fries in a basket, available in multiple topping varieties for extra charge. Service: Counter service, if no crowd is around then they will take food to your table. 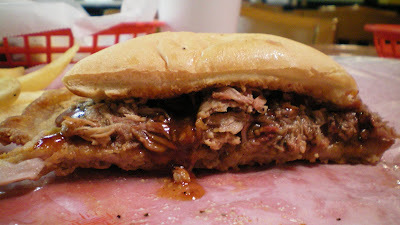 Also on the Menu: Barbecue favorites like smoked ribs, burnt-ends sandwich, and baked beans. Ambiance: There is a sizable lunch crowd from the nearby office buildings. Combined with the slow service there will be long lines to order, and you will stand waiting for your number to be called. Some smoke drifts into the dining area, which is brightly lit with generic food posters. Garish window painting colors the light that enters from the storefront. Outdoor picnic tables are covered in snow, and very close to busy street. Final Thoughts: This was definitely a unique tenderloin. It was both thin and tender, and clearly homemade. 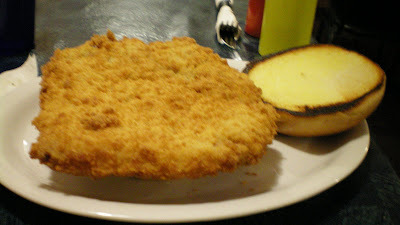 The seasoned breading makes it a worthy addition to the Des Moines tenderloin scene. Their 2 for price of 1 coupon compelled me to visit before the end of the year, and I was surprised by the results. Since I had last visited this place over a year ago, some things had changed and then changed again. The original owner had sold up, and the new operator was, by many accounts, not the same quality. Since then there has been a fire, a closing for at least a month, and the return of the original owner. The ambiance is exactly the same, but since the smoking ban this is now the smokiest restaurant in town. I can only guess Edzall has plans to stay in business, he displays his trademarks on the wall. 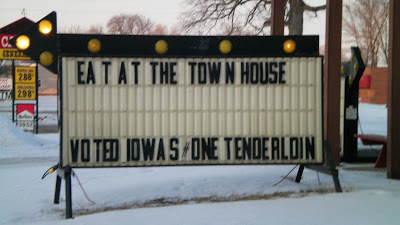 Evidently, nobody else can use the phrase "Wisconsin Dog" while doing business here in Iowa. 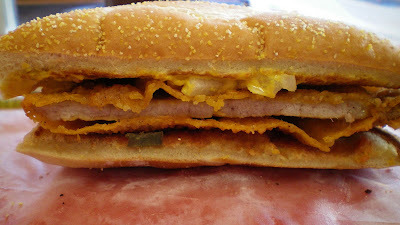 In researching an upcoming post about tenderloins at BBQ joints, I had to check out the Big Pig. Its topped with sauced-up pulled pork. 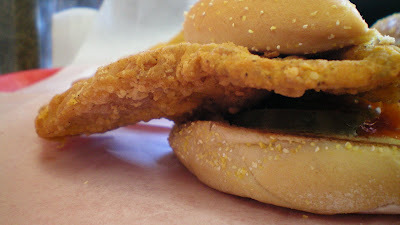 The unusual shape of the tenderloin means it is most likely made on-site. 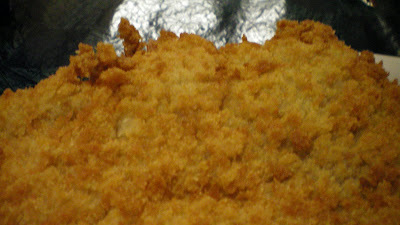 The breading sticks to the meat know, not falling off like chicken skin. The tenderloin is not as tender as I remember it. Its still worth trying.